The 3DS isn’t the first, or even the second 3D Nintendo product. Several years ago Nintendo put out the Virtual boy. That was their second foray into 3D. Their first was on the Famicom back in the 80s. The Famicom 3D System was a pair of 3D shutter glasses. It creates the 3D effect by shutters closing over one eye at a time showing a different image to the eye that isn’t blocked. This creates a 3d effect. Duck hunt for the NES is a remake of an earlier Nintendo game. In the early 1970s Nintendo created a game called Laser Clay Shooting. 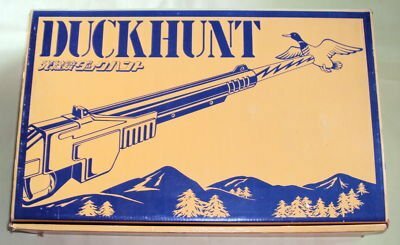 A home version of the game was called Duck Hunt. Sega was started as Standard Games in Honolulu, Hawaii in 1940. They originally made coin operated games for military bases. In 1951 the company moved to Tokyo, Japan and changed it’s name to Service Games of Japan. In 1965 Rosen Enterprises and Service Games merged and created Sega Enterprises. Their name is actually the first 2 letters of both words of their name. SERVICE GAMES becomes SEGA. Ms Pac Man was originally a Pac Man clone. Ms. Pac-Man was originally called Crazy Otto. It was meant to be an enhancement to Pac-Man, made by a company called General Computer Corporation. While the game was in development, GCC settled a lawsuit with Atari. Part of the settlement stopped them from selling new conversion kits without the permission of the original developers. Instead of stopping development, they showed it to Midway. Midway was Namco’s American distributor of Pac-Man. Midway bought the rights to Crazy Otto and changed the graphics and the name and made it Ms. Pac-Man. Nintendo operated a love hotel and taxi service. It’s pretty common knowledge that Nintendo was formed in 1889 and originally made playing cards. Not many people know that in the early 1960s, Nintendo tried some new ventures such as a taxi company, a tv network and a love hotel. Donkey Kong started life as a Popeye game. In 1981, Nintendo was negotiating a deal to make a Popeye game. When the license fell through Shigeru Miyamoto changed the sprites into what we know as Donkey Kong. Bluto became Donkey Kong, Olive Oyl became Lady (Later Pauline), Finally Popeye became Jumpman (Later Mario). Sega Master system wasn’t Sega’s first game system. On July 15, 1983, the same day the Famicom was released in Japan, marked the debut of the SG-1000. It was Sega’s first home video game system. The Sega Dreamcast wasn’t the first game system with a modem. Most people believe the Dreamcast was the first game system with a modem. They are wrong. In fact, the Atari 2600, Intellivision, Famicom, NES, SNES, Sega Genesis and Sega Saturn all had modem attachments. Rumor has it that all the sounds in the game were performed by prisoners on death row in American prisons. Space Invaders was one of the biggest hits on the 2600, but it didn’t sell as well as one of it’s worst. E.T. was the 5th highest selling game for the system. Space Invaders was the 10th.